St Joseph’s College currently has a number of overseas exchange arrangements in place. St Henry’s Marist College, Durban, South Africa (Year 10). For the past decade St Joseph’s has taken part in an exchange program with St Henry’s Marist College in Durban, South Africa. A Year 10 student from St Joseph’s exchanges with a St Henry’s Marist College student during Term 2 each year. This has been a wonderful opportunity for students to experience another culture by both living with a South African family and attending school. The students who have been engaged in the program believe it to be a priceless cultural experience for which they are grateful. *Not reciprocal, Westminster Cathedral Choir School is a preparatory school for boys aged 7–13. A post-Year 12 exchange program has been in place between St Joseph’s and the above UK schools for more than 10 years. Select students, who have completed their final year of studies at each school, exchange for a period of one year – from July to June for students from the UK, and from January to December for students from St Joseph’s College. All colleges are boarding schools and the exchange students assist as boarding school assistants/supervisors and with other general duties. 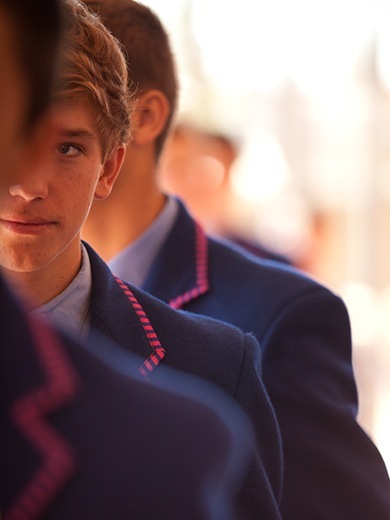 Year 12 students at St Joseph’s College are invited to apply to the Headmaster for the various school exchanges on offer in July each year. Applicants are chosen on a range of criteria, including evidence of leadership ability, community service and engagement, effort in studies, and their ability to develop positive relationships with others.